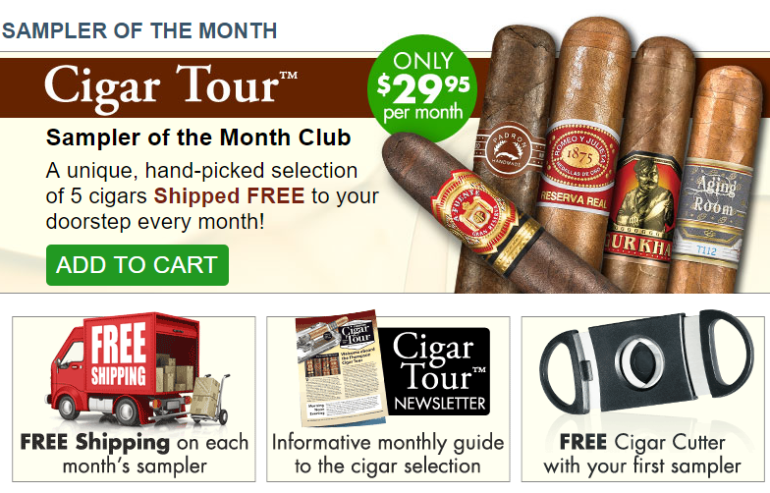 First of all, they don’t call it a “cigar of the month club” – instead, they take the unique approach of labeling theirs as the Sampler of the Month Club. We guess that makes sense since the whole idea is to sample new and different kinds of cigars in the hopes of discovering a new favorite style or variety. Our Cigar Sampler of the Month Club is the perfect way to sample great smokes at a low price while learning new facts about the fascinating world of cigars! Unfortunately, we could not find a sample of one of their previous months shipments. So all we know is you’ll get “five choice, hand rolled premium cigars” each month. With Thompson’s reputation in the cigar retail world, we expect a quality selection of cigars to be included in the club. We do know that the club has a solid 4/5 star rating on Thompson’s website, so it seems well-liked by customers. We definitely plan to check out the Thompson Cigar of the Month Club (er… we mean Sampler of the Month Club) in the near future. With a big name like Thompson, we expect nothing less than a quality club. We’ll let you know as soon as we’ve tried it out, so stay tuned for our full cigar of the month club review and comparison. Any updates? I recently got into the hobby and gave them (Thompson) my contact info. I was called the next day, and felt like the sales pitch was really confusing. The rep forwarded me to the billing department and I got cold feet- I told the next person to forget me, that I wasn’t interested. Seems to be the end of it, but Google shows that others have not been so lucky. Am I paranoid or did I dodge a bullet? Hey Dave! Welcome to the “Brotherhood of the Leaf!” Glad to hear you’re getting into the wonderful world of premium cigars. As far as Thompson goes, I’ve always had good success when dealing with them. True, their marketing/retention department can get a little pushy – but they’ve always honored my request to take me off their mailing list. I think you’ll be fine. I’d highly recommend checking out our Editors’ Choice for best cigar club. Their customer service is top notch!